The conversation often begins with telling people to leave their waders and boots at home, but plan to sight-fish for carp in the 10 to 30 lb. range. You can imagine the reactions I get, but I assure you, just as I assure my clientele, there is no exaggeration here. When fishing the Lowell, MA, canal systems for common carp (and other warm-water species), you’re embarking on a truly special excursion. From the low-cost & casual attire (no float required here) to the heart-stopping rush of catching one of these fish on the fly to the convenience of being able to stop for a bite/drink and enjoy this, the first urban national park, there is nothing like fishing in Lowell. Most have the image of carp fishing as a slow, maybe not-necessarily-strategic form of fishing. In my experience, the image associated with carp angling is quite different from the image paired with fly fishing. While one might envision the carp angler with three or four rods set up with various baits sitting on the bottom of a body of water and waiting for something to come along and take off screaming, fly fishing represents something of a more active pursuit. The way I fish and guide on the Lowell canals is something that combines and modifies these techniques into something completely other. Urban fishing on the Lowell canals is, simply put, a jewel hidden in plain sight. 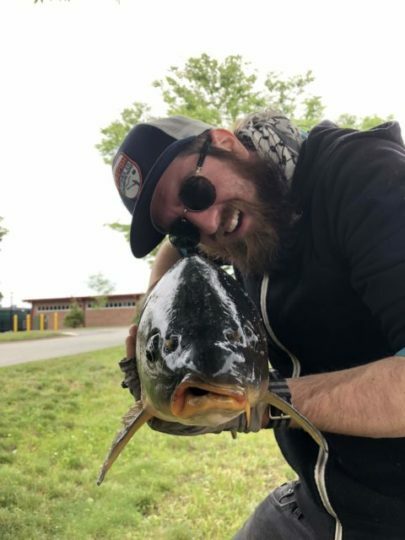 From the moment I first picked up a fly rod back in 2015, catching sunfish and bass on my way to work, to this past spring, when we saw some of the best carp fishing we have seen to date (in this angler’s humble opinion), these canals represent one of the finest urban fisheries in the state. Maybe it’s the fact that this is where I cut my teeth as a fresh-water angler, but even in addition to its very unique charm, Lowell is an incredible city that I am lucky to call my home. Looking at a map, one will observe a network of canals that flows through the city, feeding from and returning to, the Big Mack on its way to the coast. Because of this, an angler can find a tremendous variety of life in these waters, from the bass and sunfish to striper, pike, sturgeon, and even the occasional Atlantic salmon, among others. The downside: Navigating the Merrimack requires a thorough knowledge of depths, flows, etc. Basically, ya need a boat. While there are certainly spots where one can access the Mack from shore, back-casting is difficult, and you’d be better bringing the spin-gear (I would welcome corrections to this…cough cough.). So, for the sake of keeping things interesting, we’ll discuss the canals. Starting/ending in a section of town called “The Acre” allows us to make a nice loop around the city and cover a lot of water. In different sections of the canals at different times of the year, you stand a chance at finding some big calico bass, large sunfish of various hybridizations (bluegill, long-ear, red-breast, pumpkinseed), brown bullhead catfish, hungry smallmouth in faster water, carp by the score at slower and wider water…. I know, tough to choose. Lucky for you, you don’t have to. The canals are easily navigable in an afternoon or less, and, literally, any duration of time is the perfect time to be out fishing. 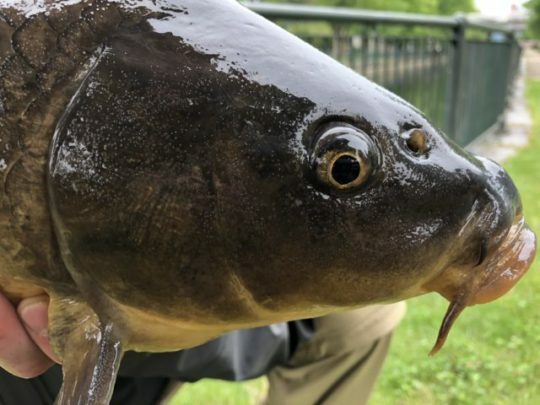 I have found the optimal fishing season to be from mid-April through the beginning and middle of October, with carp being in best form during the spring. Passing through on your way to Nashua or points north? Stop in to Lowell and fish. Got some time to kill while in between engagements near Lowell? Stop in and wet a line. Point being, I am the only fly angler fishing the canals (at least the only one I see when I am out), and I would love to share it and see more people taking advantage of this great resource. If you have any additional questions, comments, or concerns, send me an email at geoff@brackishflies.com. Be sure to follow along on my fishing adventures over on Instagram!